WASHINGTON (CNS) — A Georgetown University associate professor’s tweets that white Republican men should die a “miserable death” for supporting Judge Brett Kavanaugh’s nomination for the Supreme Court is more than just about free speech, said the head of Students for Life of America. A bonus, she suggested, would be to “castrate their corpses and feed them to swine.” Her tweets can still be found in cyberspace. Her Twitter account was suspended shortly after she posted them but as of Oct. 5, it was not clear if her account remained suspended. On Oct. 5, The Georgetown Voice student newspaper tweeted that Fair and Dean Joel Hellman of the School of Foreign Service “mutually agreed to Professor Fair (going) on research leave effective immediately.” The paper quoted a statement from Hellman. “Since our founding, Georgetown has been dedicated to the free exchange of ideas and robust dialogue,” he said. But “we can and do strongly condemn the use of violent imagery, profanity and insensitive labeling of individuals based on gender, ethnicity or political affiliation in any form of discourse. Such expressions go against our values,” he continued. 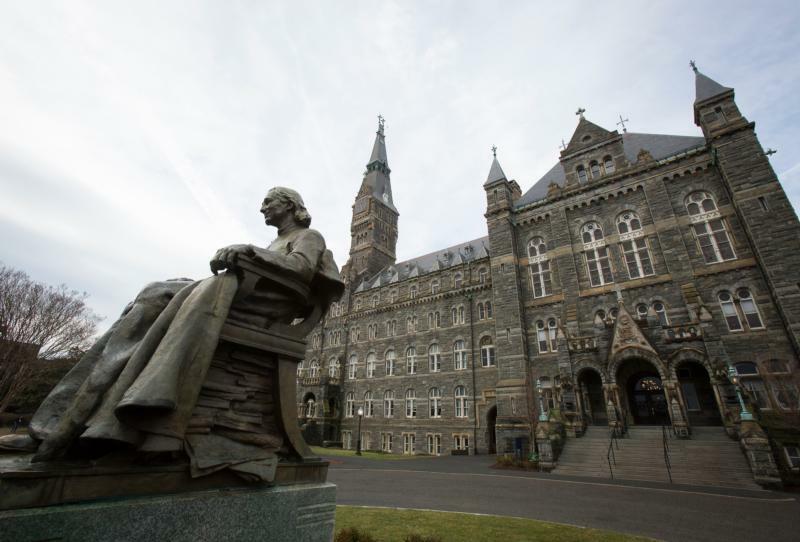 If faculty members’ comments “are determined to substantially affect their teaching, research or university service,” DeGioia said, the situation would be addressed through “established procedures” outlined in Georgetown’s faculty handbook. He did not mention her name in his statement, nor did he mention Fair in a lengthier statement he issued Oct. 5 restating many of his early points. Fair’s tweets came after a daylong hearing called by the Senate Judiciary Committee Sept. 27 to hear testimony from Christine Blasey Ford, who claimed that Kavanaugh sexually assaulted her at a party 36 years ago when they both were in high school in the Washington area. Kavanaugh also testified, vehemently denying any such assault occurred. He said he did not even know Ford. After the Sept. 27 hearing the Judiciary Committee voted to send his nomination to the full Senate, but agreed with a proposal by Sen. Jeff Flake, R-Arizona, for the FBI to take a week to investigate claims made against Kavanaugh. The FBI wrapped up its investigation Oct. 3 and sent its report to committee members for their review. On Oct. 5 senators voted 51-49 to move the Kavanaugh confirmation to a vote; a final was expected Oct. 6. A day after the committee hearing, John Garvey, president of The Catholic University of America, suspended the dean of the university’s National Catholic School of Social Service who had questioned Ford’s credibility in a couple of tweets. Among those supporting Kavanaugh’s confirmation are signers of an online petition at www.catholicvote.org urging the Senate to vote to confirm him for the high court. As of Oct. 4, the petition had more than 17,400 signatures. On Sept. 14, a group of about 65 women who have known Kavanaugh for more than 35 years sent a letter expressing their strong support for him to Sen. Charles Grassley, R-Iowa, and Sen. Dianne Feinstein, D-California, who are chairman and ranking member, respectively, of the Senate Judiciary Committee. “For the entire time we have known Brett Kavanaugh, he has behaved honorably and treated women with respect,” they said.